Priyanka Chopra and Nick Jonas got married over the weekend in a very long (sponsored? ), multi-day ceremony that, by all accounts, seemed very fun and full of laughter and love. Their wedding outfits were provided generously by Ralph Lauren. Nick wore a tux, and Priyanka wore a dress that was 100 percent overshadowed by her veil. 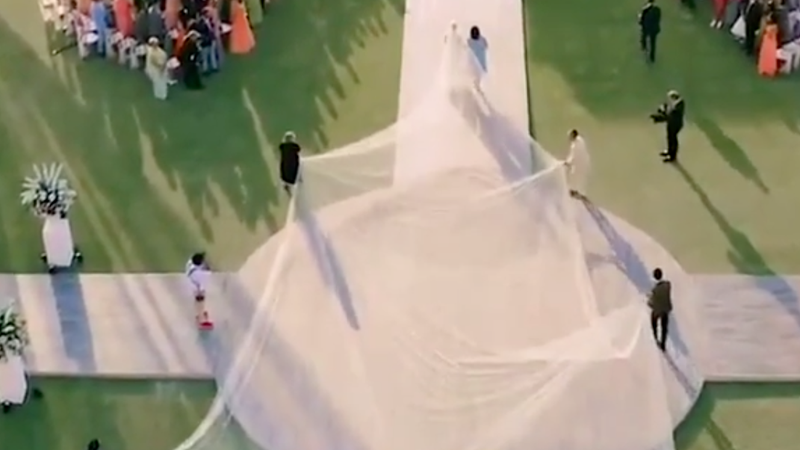 I would love nothing more than to provide high-quality photos of the veil, as it is now the veil I want for my wedding which will happen never since marriage is an institution in which I do not believe. But People has the exclusive rights to their nuptials, so this Instagram video should suffice. The dress itself is really something: “hand-beaded and hand-embroidered floral and scroll motifs and lace-effect tulle appliqués with scalloped sleeves and a high-neck collar atop a strapless column dress made up of 2,380,000 mother of pearl sequins and finished with a 75-foot long tulle veil,” according to People. While I appreciate the handiwork that went into making a strapless column dress with over 2 million mother of pearl sequins on it, I would like to draw attention to the veil—75 feet of friggin’ tulle—which required six people to manage it as she glided out of the church and towards the light of a Jonas brother. It’s like a giant mosquito net or the crumpled, deflated skin of a hot air balloon before it is full of hot air. Remember “parachute day” in gym class, when your beleaguered PE teacher would drag a bundle of gross, multicolored fabric out from behind the kickballs, open it up on the basketball court and then you’d seek shelter under its musty embrace? This is that, but with tulle. A veil. This veil. My shero.